Company Overview - Shaoxing City Huili Hardware Co., Ltd.
13YRSShaoxing City Huili Hardware Co., Ltd.
Shaoxing City Huili Hardware Co.,LTD.originally established in 1991, is a private enterprise. Located in the Paojiang Industrial Zone of Shaoxing city, also close to Shanghai port, our company enjoys beautiful environment and convenient transportation. With advanced technical equipment and first-class production management flow line, our company is striving to make excellent products. Now we have perfect management, perfect technical equipment and excellent quality service. Our leading products - staples and nails - have been exported to markets worldwide. Praised by customers, we get more and more orders from foreign customers. Our main products cover #10, 26/6, 66/8, 66/6, B8, 23 series, 10J series, 10F series, 4J series, 4F series, carton staple series, C staple series, U staple series, stainless steel 23 series, stainless steel industrial staples, copperized steel staples, hog rings staples, copperized steel carton staple series, N series, P series, M series, 92 series, 80 series, 50 series, 53 series, 12F series, 90 series,14 series, 11 series, 19 series, SB series, 71 series, copperized steel brad nails, cupreous brad nails, galvanized steel brad nails, and 5019 series.Adhering to the spirit of "Based on people; surviving on quality; developing on credit standing", we will develop together with customers around the world. 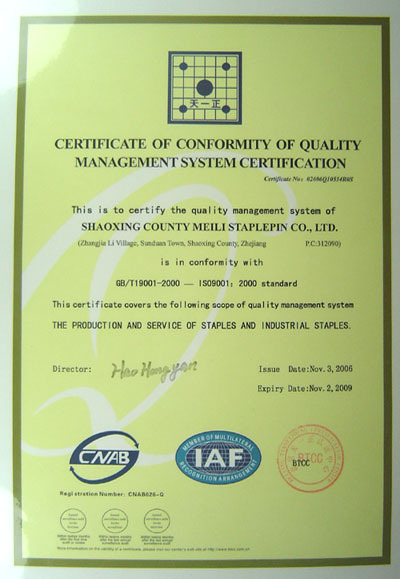 Issued by Beijing Tianyizheng Certification Center. The product and service of staples and nails.